Michael Acton Smith has hustle. Defined in his own words as someone with ‘that entrepreneurial magic’, he has it in spades. From selling his body to medical science to fund his first venture, to bringing current business Mindcandy back from near extinction, Smith’s got style and tenacity. He also has ambition. His own mother tells a story of how excited she was to hold her eldest child’s hand when he learned to stand and walk as a baby. Only she never got the chance, because as soon as he could stand, he began running. And he’s never stopped since. One of the first things you notice about Smith is his energy and enthusiasm. Both are infectious. Like the best of entrepreneurs, you leave him with a genuine interest in his endeavours, and a fervent desire for the business to succeed. Dressed head-to-toe in the black uniform that has become synonymous with the Silicon Roundabout residents (the Mindcandy office is in the old Tea building in Shoreditch, east London), Smith is unassuming, with just a few leering skull rings and his erratic mad-scientist hair giving a nod to his slightly more eccentric, creative side. Eventually, Smith left home to study geography at Birmingham University – an odd choice of subject for the creative teenager. But then it wasn’t a decision he took onerously. “Someone told me that geography had only four hours of study,” he says. “I was also told the best-looking girls did geography,” he adds, sheepishly. “They lied; they did psychology.” For Smith, university wasn’t really about academia. In the first week he met Tom Boardman at the chess club, who went on to be one of his best friends and co-founder of Firebox.com, Smith’s first business. After university, Smith took the obligatory gap year and went travelling around the world, before getting a ‘sensible job’ on his return. But it was hardly a flying start. Working from Boardman’s parents’ house in Cardiff, the business wasn’t gaining much traction. Despairing, the pair were ready to throw in the towel and headed to the pub to drown their sorrows. It was there they conceived of ‘Shotglass Chess’. As the name suggests, the regular pieces on a chess board were replaced with shot glasses, and as the dominant player took more of his opponent’s positions, he would have to drink the shot in its place. “Think of it as an inbuilt handicap,” explains Smith. The game featured in the national press and the company “went from turning over £20 a month, to £20,000 a month.” Shortly afterwards, they managed to raise some investment, changed the name of the company to Firebox (as directed by their investors) and the rest is history. Investors clearly thought so: he raised $10m from two of the world’s biggest venture capitalists: Accel and Index. The press coverage was overwhelmingly positive too, with Perplex City being hailed as the future of gaming, and Mindcandy swept the board at industry awards events. Yet Smith was having an increasing number of sleepless nights. “The world was telling us we were amazing, but I’d wake up at 4am every day thinking something just wasn’t right. As an entrepreneur, you’ve got this really good gut instinct. A sixth sense, almost.” Smith wasn’t happy with the game. “It was just too complicated. Not enough people were playing,” he says. So he was forced to make a difficult decision: “I decided to can it,” he explains. “I had a little less than £1m in the bank. I thought if I stop now and try something new I’ve got just about enough time to see if we can make something else work.” That something new was Moshi Monsters, the online world of adoptable pet monsters. “I felt that the next canvas on which to create incredible entertainment for kids, was going to be the Internet. Walt Disney had done it with animated movies back in the twenties and Jim Henson had done it with Muppets and TV shows. More recently, John Lasseter has done it with Pixar. So that’s when I decided to create Moshi Monsters.” It was a slow start. Moshi launched in 2008, but made no real impact at first. “Then in summer 2009, it just took off like a rocket,” says Smith. “We started adding one new sign up every second.” And the stratospheric growth shows no sign of slowing: Moshi can now boast a membership of more than 60 million kids worldwide. And once the online concept was proven, it was time to see if the brand would work offline too. Smith and his team began to experiment with licencing – something that has proven incredibly lucrative for Moshi. “Licensing is a fascinating industry,” says Smith. “We’ve done about 120 deals with partners now. And last year we sold about $100m at retail just on physical products.” As anyone who has a Moshi-mad child in their life will know, it seems the little moshlings are everywhere – from adorning wrapping paper and magazine covers, to Moshi sweets, soft toys, books and music. So what’s next for the world’s newest kids’ entertainment brand? First, global expansion. Currently, the UK and the US are the two biggest markets, combined totalling about 60% of the Moshi audience. At the moment, the only other language Moshi is in is Spanish. But more will be on the way later this year. Secondly, is the team’s focus on mobile. “That is an unbelievable growth area,” says Smith. “The tablet is going to be the dominant entertainment device. Kids will watch movies on it, they will play games, they will do educational stuff and they will listen to music. We are betting massively on tablets.” Moshi Monsters already has a few apps in the marketplace now, but the biggest development on this front will come in a few months’ time, when a mobile version of the Moshi Monsters site is released. The third thing is adding some stablemates for the little moshlings. 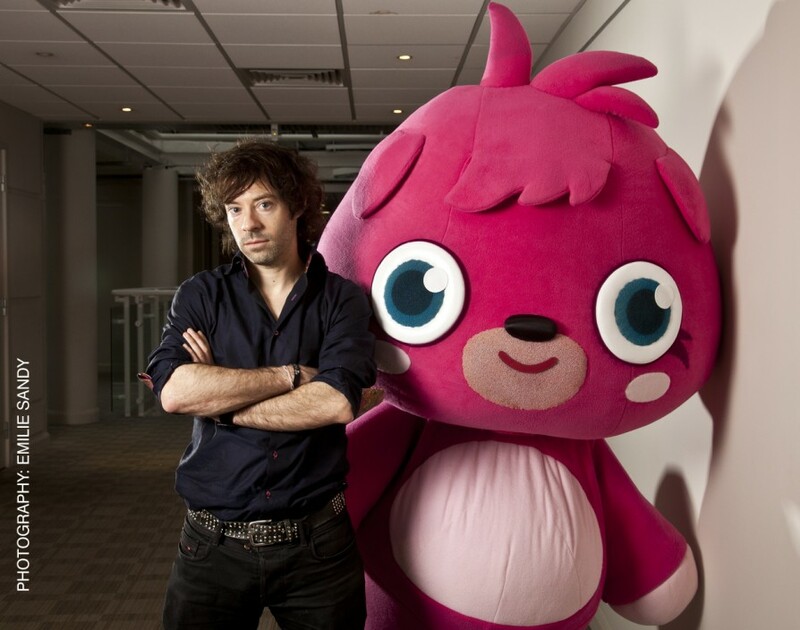 “We learnt so much with Moshi Monsters; we’ve got an incredible team and we’ve got respect. But what do we do after? Can we create other games, other experiences for kids? Disney didn’t just create Mickey Mouse, but Donald Duck, High School Musical and Mary Poppins,” says Smith. Smith is certainly ambitious. Spending just an hour in his company is long enough to assure you that he is capable of achieving whatever he puts his mind to. He talks big: he wants to be the Walt Disney of the internet age. When he was younger, one of his idols was Richard Branson. And now not only has he met Beardy, and talked on the same stage as him, but had a rather more personal conversation too. “We were talking about Necker Island, as I’m planning to buy an island too,” Smith reveals. So, is he capable of transforming the traditional children’s entertainment market? We’d put money on it.